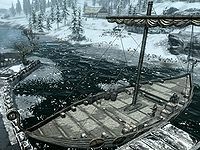 The North Wind is a ship docked at the Windhelm, in the berth furthest to the east. The vessel has several crates and unusable barrels on deck along with a couple of chairs. You will find both the captain, Kjar and Dalan Merchad on deck at all times, however the other member of the crew, Voldsea Giryon will be found wandering Windhelm and will happily speak to you explaining that she's glad that they are laying over in Windhelm for a while and that she likes to walk when on land to keep her legs strong. Speaking with Dalan Merchad on the other hand, has him complaining and wishing they were under way. The captain will ask you to assist him with a problem and will reward you with a years salary (a leveled amount of gold) if you accept and complete the quest.